The Federal Reserve first unveiled its program to buy U.S. government bonds in November 2008. At that time, the stock market was still in a precarious position and the bond market reflected concern that the economy was not ready to reflate. Many pundits were concerned that this bond buying program, called Quantitative Easing, would lead to runaway inflation. This unprecedented use of the Fed’s balance sheet was a difficult decision for the markets to digest. Now six-years later, the program has come to a close. The Federal Reserve’s balance sheet has grown from under $1 Trillion before the program began to $4.5 Trillion now. The Fed purchase U.S. Treasuries and also government Mortgage Backed Securities through three different rounds of Quantitative Easing. Bond yields continues at a moderate level through the bond buying program. If the Fed had not been buying bonds, rates could easily have risen 1-2% over this time. 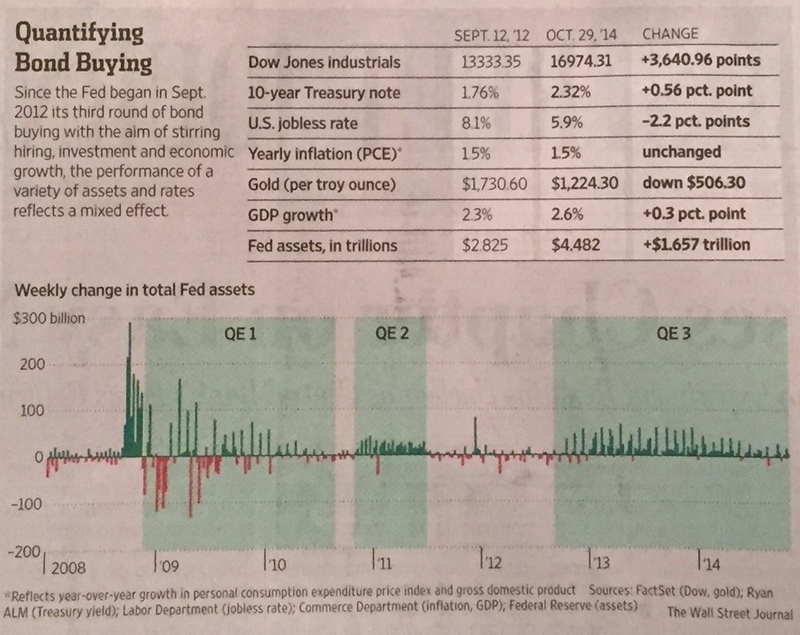 The figure below shows the performance of the markets since QE3 began in September 2012. This final round of Quantitative Easing was the most criticized by the markets, but it definitely helped. The stock markets used this event as a catalyst to push higher, with the Dow Jones and S&P 500 now sitting close to all-time highs yet again. The U.S. employment markets were certainly supported by low rates and the belief that the Federal Reserve would support the economy, with the unemployment rate dropping from 8.1% at the time of QE3 to 5.9% now. I believe that history will judge Quantitative Easing as a strong program that helped the U.S. economy through a very rough patch.